For 2010, Penske Racing's IZOD IndyCar team will have an all-new look for their full-time three car racing effort. 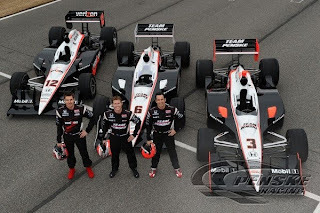 Sporting a matching black and white appearance, Helio Castroneves, Ryan Briscoe and Will Power have shown off the popular team's colours as IZOD IndyCar teams are attending an open test at Barber Motorsport Park. The familar red and white paint scheme was worn for the first time by one of Roger Penske's race cars in 1990 when Emerson Fittipaldi brought Marlboro cigarettes sponsorship from Patrick Racing. Having become ingrained in Penske's racing efforts for two decades, the iconic paint rode on cars propelled to 8 Indy 500s including Rick Mears speedway record-tying 4th victory and 4 open wheel championships with the most recent occurring in 2006 Sam Hornish Jr with the IRL/IndyCar championship. The Marlboro/Penske livery was also a all to familiar sight in the 1994 CART championship where a three-car Penske team dominated much of the season, winning 12 of 16 events. Since 1990 however, the sponsorship of tobacco products at sporting events was more than ever a hot-button issue in motorsports. Often lucrative supporters of auto racing in the decade before the 21st century, concerns that tobacco advertising could attribute to poor health caused the governments of many countries to crack down on the tobacco industry's influence. At the end of 2006, the Marlboro name disappeared from the Penske Racing Indy cars in accordance to a Tobacco Settlement Agreement. The livery remained on the Team Penske vehicles for 3 more IndyCar seasons with the race team receiving sponsorship money from the Tobacco company for at least part of brand name's departure. 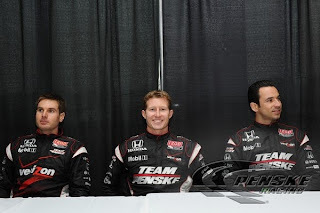 Regardless of team colours, the 2010 Penske Racing squad are going to be eager to again contend for the IZOD IndyCar championship crown. As the series prepares to start in Sao Paulo, Brazil on March 14th, it's unfair to bet against any one of the Penske Racing drivers.